Editor’s Note: the following Pete Dunton article was originally published on September 14, 2013 on Mustang Pasture. What if you had a time machine and managed to go back in time just a little before 1964 and prevented the release of the 1964 1/2 Mustang? Sounds like a cheesy movie plot doesn’t it? But if one had been successful at such an endeavor, imagine the effect it would have had on the automobile industry. There still would have been muscle cars but unfortunately no pony cars. The Mustang was such a smash success that it spawned competitors from many other American automobile brands. And soon after the Mustang’s release the pony car blossomed into a true performance car. The difference was that most of the muscle cars during the 1960s were mid-size cars while pony cars were, substantially smaller in size, 2+2 sport coupes. With the craze the Mustang caused when it was first released and with its continued popularity 50 years later, there’s no doubt the Mustang is now ingrained into American culture. Even worldwide the Mustang is recognized and respected as an American icon. The younger crowd may have been buying these new compact cars, however they found that it was more out of necessity than love. Ford tried at first to spiff up the Falcon and make it more palatable to the youth market by adding bucket seats, a 260 CID V8, and even a floor mounted top-loader 4-speed manual transmission. Even with these items the 2-door Falcon still couldn’t stir up the passions amount the youth market. Ford to its credit was realizing that a sporty 2-door Falcon wasn’t the right kind of cheese to bring the mouse to the trap. It had to do better. What Ford did with Lee Iacocca leading the way, was develop a stunning drop dead gorgeous car on the Falcon’s unibody platform. It was the greatest makeover in automobile history. The Mustang in essence had used the same platform (the wheelbase was slightly shorter than than the Falcon’s), drivetrains, suspension, and other Falcon parts. The buyers didn’t care because the Mustang looked oh so good. In fact most at the time of the Mustang’s release thought it was the best looking car Ford had ever designed if not the most attractive American car ever produced. The Mustang’s lines were 100% original, there was no borrowing from any other Ford model or any other car on the road at the time. The automobile industry would never be the same after the release of the Mustang. It wasn’t the first time an automaker would put pretty exterior lines on a car to garner sales however it was the first time a low-priced car would get such beautiful exterior lines. Before the Mustang a low-priced car may have been attractive, but it still had a budget look. With the Mustang you got a car that looked as expensive as Neiman Marcus for a Walmart price, which was at the time unprecedented. The youth may have loved the styling but what got them into the Ford dealerships and signing on the dotted line was the ultra-low $2,372 base price for the coupe and $2,614 for the convertible. The Mustang appealed to not only men but also women. And many who could have easily afforded a more expensive car still opted for a Mustang. Ford produced from March 1964 to August 17, 1964 an amazing 121,538 1964 1/2 Mustangs which was only 5 months – this was a much higher number than the 2-door version of the 1964 Falcon which had a full year of production. From March 1964 to the end of the 1965 model year Ford had produced a whopping 680,989 Mustangs. Technically according to Ford, all Mustangs produced during this time frame are considered 1965 Mustangs. The "1964 1/2 Mustang" nomenclature was a way enthusiasts have traditionally used to easily distinguish the first wave of Mustangs produced from the latter 1965 Mustangs. All 1964 1/2 Mustangs were officially titled as 1965 Mustangs so technically first year total production for the Mustang was 680,989 units. Comparing this figure to the the total production of the 2011 Mustang which was 10 percent of this, at 68,650 units, you realize how spectacular these first year Mustang sales were. Henry Ford II wanted to name the original Mustang the T-bird II, fortunately he didn’t get his way. The Mustang was much smaller than the Thunderbird (T-bird), and where the T-bird was long, wide, and low. The Mustang was short, narrow, and high in appearance but still managed to have a long in appearance hood and very short decklid. The twin headlights were surrounded by a large open grille area which had an ornate prancing Mustang horse that gave the Mustang a very sporty look. The rear also had stylish looking taillights. The lines on the original Mustang were nothing short of perfection – every curve, crease, and bend in the exterior body panels blended together perfectly. The 1964 1/2 Mustang coupe had a curb weight of only 2,583 lbs. Even most compact cars today weigh more than this. And the other 1964 1/2 Mustang body style, the convertible, weighed in at a fairly light 2,789 lbs. The fastback body styling was rumored to not have been produced until late-August 1964 thereby officially missing the August 17, 1964 cutoff date which was the last day of the 1964 1/2 Mustang production as previously mentioned. Ford started off the 1964 1/2 Mustang with modest engine offerings. A V8 powered Mustang may have been less expensive than a 1964 Pontiac GTO, but it didn’t stand a chance in a stoplight race to the more muscular Pontiac. It would take Carroll Shelby’s work beefing up the Mustang and Ford’s release a few model years later of a big-block V8 powered Mustang, before the Mustang could compete with the genuine muscle cars like the GTO. 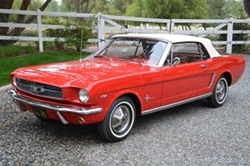 For 1964, the Mustang was just happy being a very attractive car with reliable engines. Ford at the start of the Mustang production run only offered three engines with the 1964 1/2 Mustang. The standard engine was the 101 horsepower U-code 170 CID straight-6. The optional engines were the 164 horsepower F-code 2-bbl 260 CID V8, and the 210 horsepower D-code 4-bbl 289 CID V8. Transmission choices consisted of a 3-speed and 4-speed manuals and a 3-speed automatic. In adhering to the Mustang’s sporty nature, all transmission shifters were mounted on the floor. However Ford managed to slip the 271 horsepower K-code 4-bbl 289 CID V8s into a few select rare 1964 1/2 Mustangs (here’s one of those very rare cars). Even though the option was listed Ford’s 1964 1/2 Mustang literature, not many knew about this very late 1964 1/2 option, by the time word had gotten around 1964 1/2 production had ended. There’s no doubt the hottest combination was the K-code 289 teamed with the 4-speed manual. Motor Trend magazine (June 1964) tested a 4-speed K-code equipped 1964 1/2 Mustang coupe and obtained a 0-60 mph time of 7.5 seconds and a quarter-mile time of 15.7 seconds at 89 mph. Not too shabby, when this combination was ordered the Mustang was one of the fastest smaller sporty 1964 model year cars available in the U.S. Though it wasn’t fast enough to compete with the 348 horsepower tri-power 389 CID V8 powered 1964 GTO, it was spot on just as quick as the base-level 325 horsepower 4-bbl 389 CID V8 equipped 1964 GTO – Motor Trend magazine (Jan 1964) obtained a 0-60 mph time of 7.7 seconds and a quarter-mile run of 15.8 seconds at 93 mph. 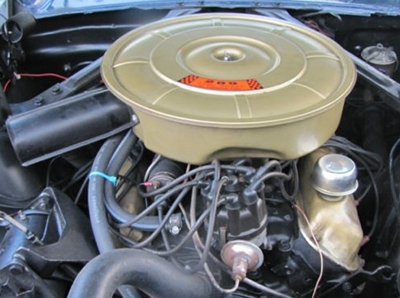 The K-code V8 was referred to as the "289 High-Performance" engine in Ford sales literature, Ford fans gave it the more catchy nickname "289 HiPo". The best thing about the K-code Mustang was its extremely reasonable price, Motor Trend mentioned the price of a new K-code 1964 1/2 Mustang was as low as $3,361.45. However the 325 horsepower 1964 GTO was a better performance bargain with a base price of just $3,081. There were a few differences between the 1964 1/2 and 1965 Mustangs. The biggest of which is all 1964 1/2 models had a generator versus an alternator which was found on the 1965. The 1964 1/2 also had large horns mounted near the lower portion of the radiator while the 1965 had smaller horns mounted higher up near the top of the radiator. The 3-speed automatic shift handle was much smaller on the 1964 1/2 in comparison to the gigantic 1965 automatic shift handle. There were a few other very minor differences, but unless you have an acute eye you won’t see them. 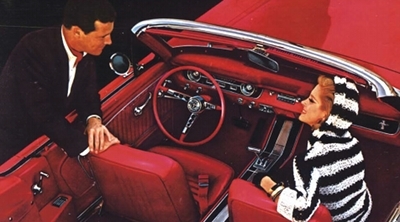 The Mustang may have been spartan in nature, especially in comparison to the average Thunderbird which was loaded with options such as power windows, leather seats, etc. 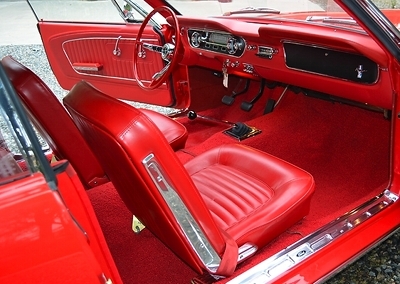 The Mustang’s interior was basic – a set of front bucket vinyl seats and rear vinyl seats. However it was stylish and very modern. The dashboard had very attractive curves and bends. The instrument cluster though modern was grabbed from the Falcon which included the Falcon’s rectangular speedometer. The round pods on either side of the speedometer were also grabbed from the Falcon, housed the fuel and temperature gauges. 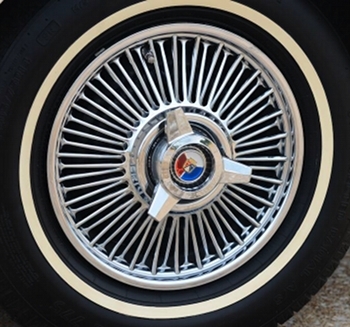 The design was borrowed right from the top-of-the-line Galaxie. When the optional front center console was ordered it gave the interior a very classy look. For the ultimate performance look there was the Rally Pac which included a round tach and a round clock both of where were attached to the steering column. And for those who opted for the convertible, the optional power top and vinyl tonneau cover were well worth the extra cost. Ironically the Mustang wasn’t the first pony car, the 1964 Plymouth Barracuda, a sporty 2+2 coupe, beat it to the market by a few months. But the Barracuda lacked the pizzazz and the rockstar appeal of the Mustang, so it was overlooked by most buyers. Since history is written by the victors, the Mustang has forever forged for itself the image as the ultimate game changer in the automobile industry. Nothing was ever the same after its introduction.